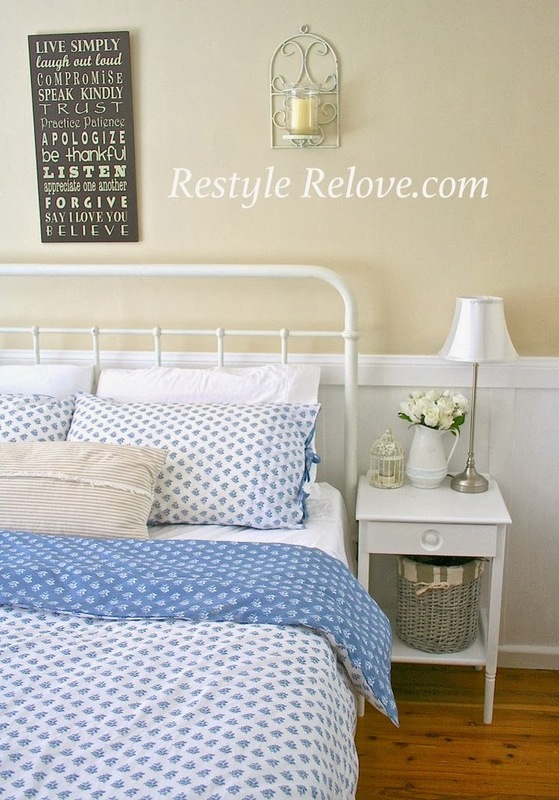 After recently completing my gorgeous Farmhouse style makeover on our Master Bedroom, (which you can view by clicking here) I thought it would be fun (and a little be embarrassing) to have a look back in time at all the various makeovers this room has had over the last 3 and a half years. However, in the beginning, our bedroom was pretty plain. When we moved in we had repainted the walls Antique White, and also tore up the old carpet and had the original floorboards refinished. I love our floorboards. The wall colour didn't really grow on me however. Because our bedroom is quite small, we thought it would be a good idea to buy a low bed. So we bought a wooden bed which I painted white and distressed. And matching low side tables which I also repainted white and distressed. And looking at this picture, the thrifted side lamps were tiny! I also, and with great trepidation, bought our first white quilt cover. And loved it. It didn't get any dirtier than our patterned ones. But thereafter, our bedroom never got much decorating attention as I really had no idea what style I wanted. Until I decided I wanted to wrought iron bed. I really wanted a white one with rounded edges, but they were too expensive and when this black one appeared on ebay I impulsively grabbed it. But it wasn't long before the colour and shape of the bed started to annoy me. The ends were curving the wrong way and it just wasn't want I wanted. So I decided to give the whole room a make over to try and make the bed work better. That is where it all went down hill. I had recently sewed my first patchwork quilt and that was the inspiration for the overkill of green accents and furniture. I replaced our white low side tables with a pair of thrifted Queen Anne side tables which I painted a bright turquoise. The side lamps were spray painted turquoise and I recovered my lampshade in leftover fabric from the quilt. 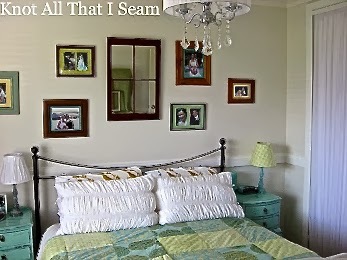 I framed our wedding photos using bright coloured matts and hung them on the wall above the bed. 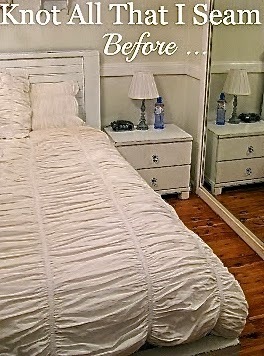 I also thought it was a good idea to cover the mirrored wardrobe doors with fabric. But there was just too much going on in this room to relax. I look back now and wonder what was I thinking!? Perhaps I was trying to draw attention away from the bed? Anyway, it wasn't long before I undertook another makeover to tone it all down, a lot. I decided to go very neutral. The black bed stayed, but the side tables were repainted white and all the green disappeared. The bedding was replaced with all white again. The pictures on the wall were removed and replaced with a set of 3 black and white framed cottage drawings. Much more tranquil but I still wasn't happy with the bed. And the room still didn't fell right but it would do for a while. I ended up selling our side tables and replacing them with different ones, although now I can't even remember what they were cause shortly after Hubby said he missed our Queen Anne bedside tables so I purchased another set and painted the lower half a more vintage style green. I was having back problems and decided it was a good excuse to replace the bed. Hubby was not happy with me changing our bed yet again, so I looked around for the cheapest wooden one I could find, similar to our original bed. I also liked the idea of mismatching pillow cases. But that, and the pale salmon quilt cover, and green side tables, were still not working. I was however happy with the decision to repaint the walls Dulux Hogs Bristle Half. It made the room so much warmer. And on the lower half of the wall I installed board and batten panelling and painted it white to contrast. I think this was the beginning of my preference for Farmhouse style, although I didn't know it yet. And in a bid to make the bed look a bit prettier, I made a drop cloth cover for the top bed head. Progressively I changed out the side tables for the white ones I had in the sun room. Again, they turned out to be very much Farmhouse style. 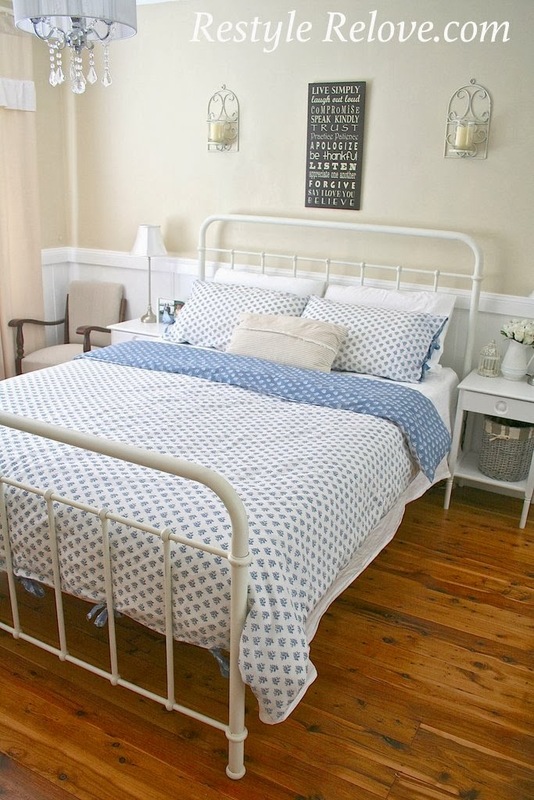 And then I discovered this gorgeous blue and white Laura Ashley, you guessed it, 'Farmhouse Style" quilt cover. 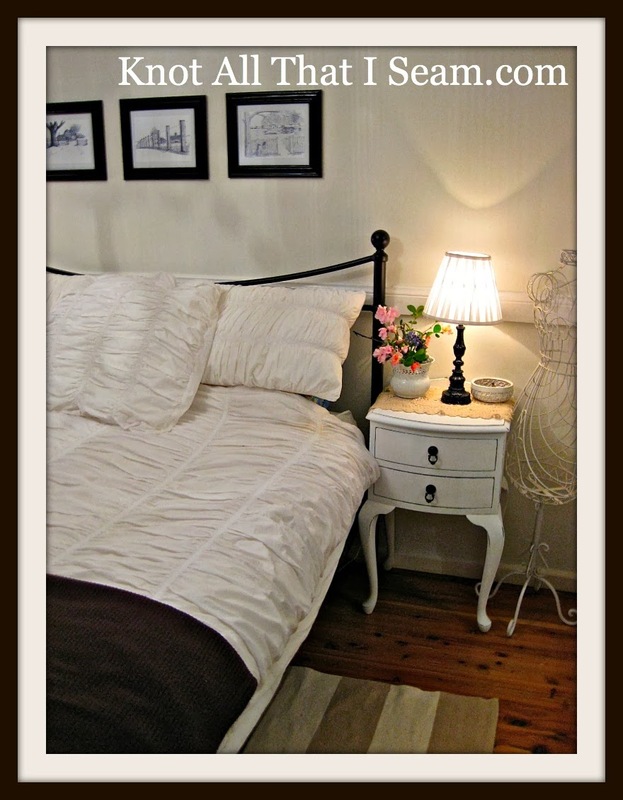 Then after browsing Farmhouse style bedrooms I added new taller brushed silver lamps with silky white lampshades. 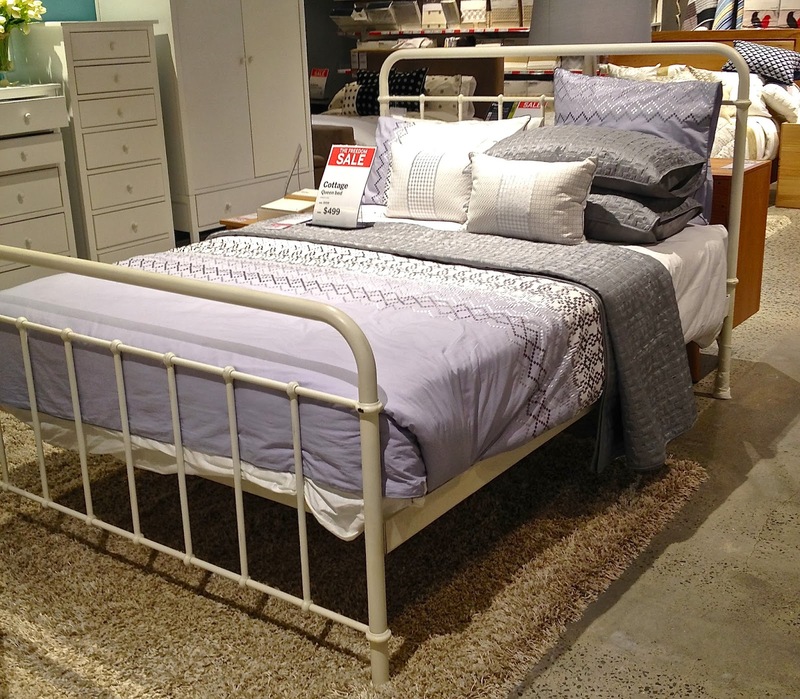 Then I saw my dream bed. It was love at first sight. It was in Freedom Furniture and I had to pinch myself to believe it was half price! I had to have it. Here is how it looked in the store. Gorgeous, right? And from there everything just started to fall into place. I found a print and some candle holders for the wall above the bed, and some Farmhouse style baskets to go under the bedside tables.